Place bulgur in a small heatproof bowl. Pour boiling water over the top and give bulgur a gentle stir. Let sit for 30 minutes. If any water remains after that time, drain the bulgur well using a fine mesh sieve. I also like to press on the bulgur with a few paper towels to extract as much of the water as possible. Then place bulgur in a large mixing bowl to cool to room temperature. In a small bowl, whisk together olive oil, lemon juice, lemon zest, garlic, salt and pepper. Pour over cooled bulgur and stir to coat evenly. Add parsley, mint, green onion, red onion and cucumber to bulgur. Then dice two of the vine-on tomatoes and add to the bulgur, leaving behind any tomato juices left on your cutting board. Fold gently to combine. Place Tabbouleh in refrigerator for 1 to 3 hours before serving. 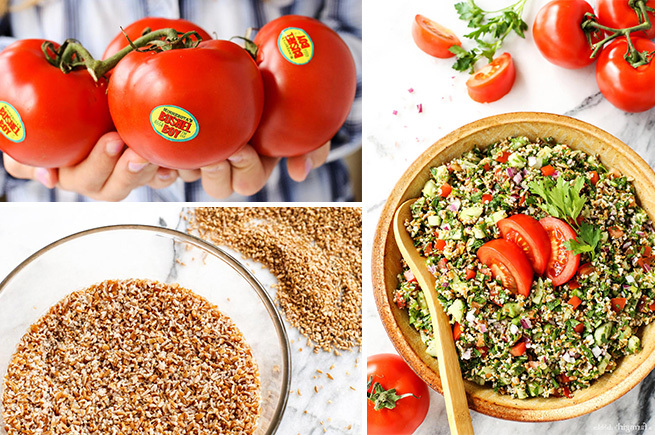 Transfer Tabbouleh to a serving bowl or platter. Slice the remaining vine-on tomato into wedges and arrange over the top of the salad. Serve immediately. Recipe Courtesy of: Brenda Score of a farm girl’s dabbles.